Stitching Dreams: Bunny Stitching and a Big Blog Honor All the Way From Britain! Bunny Stitching and a Big Blog Honor All the Way From Britain! Hello, hello! And how are all of my stitching friends on this mid-March morn? March has certainly lived up to its "in like a lion" reputation for many of us here in the U.S, hasn't it? Wild winds, power outages (we had a seven-hour loss of power last week. Oh, dear--I'm afraid there was nothing to do but stitch!! ), and the most beautiful snowfalls have been the norm for the past two weeks. It looks like a cold week ahead and I fear my oldest son, who is visiting from sunny, warm southern California, will never want to come back east. I did warn him ahead of time to pack warm clothes! It will be interesting to see if the month calms down and goes "out like a lamb." Pink and bunnies just seem go together! For this pillow, I used 32 ct. white Jobelan and wanted a pinker house so I substituted DMC 760 for the suggested color. I've always loved the pink and gray color combination since I was young. I vaguely remember a pink-gray skirt?/pair of slacks?/vest? (mom, do you remember?) that I just loved and wore with a pale pink sweater. Not sure that I've owned a pink piece of clothing since! (Oh, I guess I do have one pink/peachy sort of sweater!) So, I decided pink and gray would be the way to go for this as it pulled together both the pink of the house and the gray of the border. I cut a tiny white bunny out of some pink bunny-printed fabric and used him as my lower left corner square, topped it with pale pink ric rak, added cording, and thought I was done. But, something was missing... When I added the little polka dot bow in gray, it just pulled the whole thing together! I love it! And my vintage ceramic bunny seems to approve, too. My next bunny is also a Prairie Schooler design from Book No. 52 "Prairie Year-Rounds." He is stitched on 28 ct. black Monaco with DMC threads. I changed all of the suggested colors and substituted DMC 223, 712, and 3364. Love his little pink nose and that flower he is jumping over. I haven't quite decided how to finish him yet, but I'm hoping an idea will come to me and I'll share it with you next time I post. As you can see, a bit of progress has been made on my "A Walk In the Woods" sampler. Letters O, P, and Q have joined the party along with the prettiest little brown bird resting on a branch of red berries. I'm still enjoying each and every stitch of this one! Thanks to all who voted for me and to Immediate Media! This award has so much meaning because it was chosen by you, my fellow stitchers--so a sincere "thank you" goes to each of you who cast your vote for my blog. I truly appreciate all of your supportive comments and emails over the past eight years that I've been blogging. They are what keep me going--truly! As I mentioned in my earlier post about the nomination, I don't blog for money or fame. I am actually quite shy and introverted, but I've always loved to write which is why I put in the time and energy it takes to create a successful blog. I'll be sure to share a photo of my trophy when it arrives--wherever shall I keep it?! New Giveaway for this pretty chart... As you know from previous posts, I've been doing some housecleaning and going through old stitching magazines. 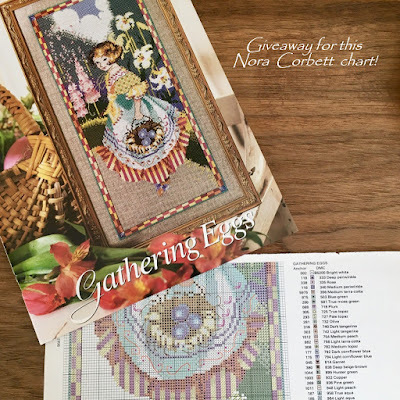 I'll be giving away one chart each time I post and this time it is for a lovely chart from Nora Corbett of Mirabilia fame called "Gathering Eggs" that would be wonderful to stitch for Easter. Isn't she pretty with those giant flowers in the background and basket of periwinkle hued eggs? If you are interested in giving this chart a new home, just let me know in your comments. This is just two pages torn from a magazine--not the whole magazine. If more than one person wants it, I will do a drawing. PLEASE, PLEASE make sure to include your email in with your comment--I won't be trying to track anyone down if they haven't included their email address... Also, just so you know, I will be folding this up and mailing it in a legal sized envelope to save on postage. Putting our lives into perspective... A casual friend died a week ago. She was someone I knew through my best friend's family and I would see her at weddings, bridal and baby showers, and get-togethers once or twice a year. In fact, I sat next to her at a baby shower in late November and thoroughly enjoyed laughing together as we watched a game of charades and discussed my son's upcoming wedding as she shared photos of her son's wedding that had just taken place in September. And then, everything began to fall apart for her. Her symptoms began in January and just last week she became one of the "one in a million people" affected by a little known disease. It happened that quickly... I'm having a particularly hard time with her death. I think about her husband who just retired and had plans for traveling with her and about her two children and those adorable grandchildren who will grow up making so many memories without her in the picture. And about her elderly mother who still remains... At 65, she was just three years older than me and it really makes me reevaluate how I'm spending my time. Retirement has been on my mind for quite some time, but it has jumped much further forward since learning of her death... We need to try to make your days count and think positively--you just never know what lies around the corner, do you? Big congratulations Carol on a well deserved award. The bunny ornament is gorgeous. Pink and grey is my favorite color combo also. Good progress on the other projects, that bird is a cutie. Sorry to hear about your friend's death. Incidents like this make us realise that we should get the best out of the time we have. The weather here has been blah. We had the worst dust storms in 3 years yesterday and its taking its time to settle down. Congratulations Carol! I am so very glad you won. I love that little bunny finish! I think you are smart to not push retirement off Carol. If you do not have to, why? Enjoy your time doing things you have always wanted to do. I agree with you about your friend...I am the same age as you and morality does become an issue. We know our days are winding down but it is hard to believe. On a happier note, I am stitching a bunny this week. April Showers bring May Flowers has a pretty brown bunny in the pattern. ( Prairie Schooler April). Congrats on your honor!! Well deserved. Congratulations Carol on your British Craft Award; well deserved! I've enjoyed your blog for years. 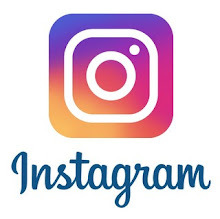 Also like your new blog page. We woke up to snow, sleet and iced over trees this morning, so your bunny stitching brought spring inside at least. Loosing a friend certainly puts life in perspective especially when it's so close to our age. I've always thought that it was our parent's friends who passed away, now it seems to be some of our friends. Make a memory each day. Happy stitching! Your bunny stitching is gorgeous,I love the bunny with the flower.I am looking forward to seeing him finally finished. It is very sad to read of the passing of the lady you knew,so young too.We had a similar experience in 2014,the person concerned was six years younger than me and it was a massive, unexpected shock.You are right,it does make one re evaluate lifeit makes everyone andeverything that much more precious. 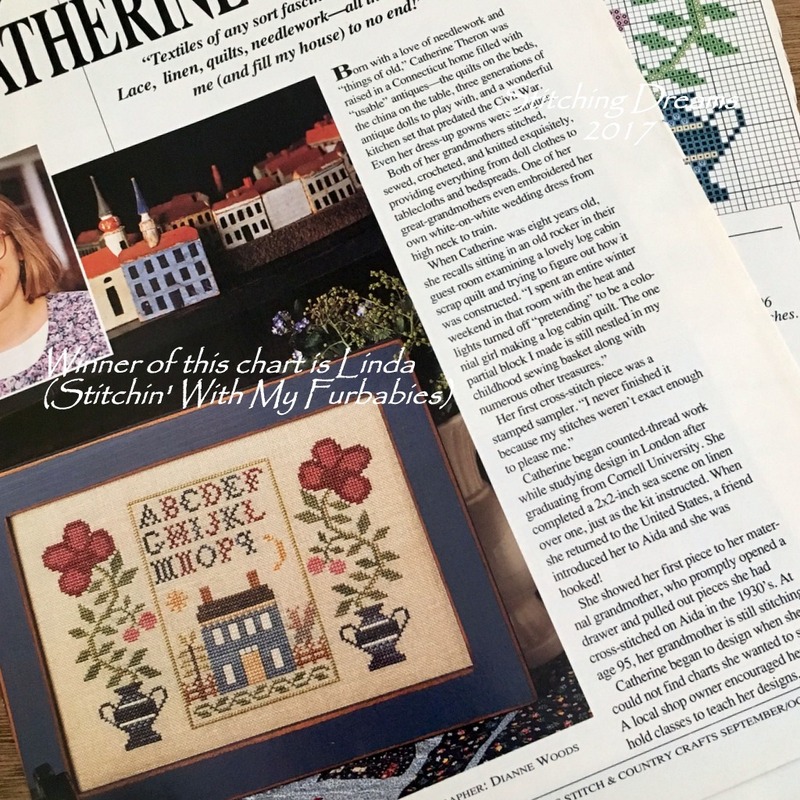 I think that is so wonderful about your award and you deserve it : ) Your stitching is so inspiring (and lovely) and your blog is a pleasure to read! Congratulations! 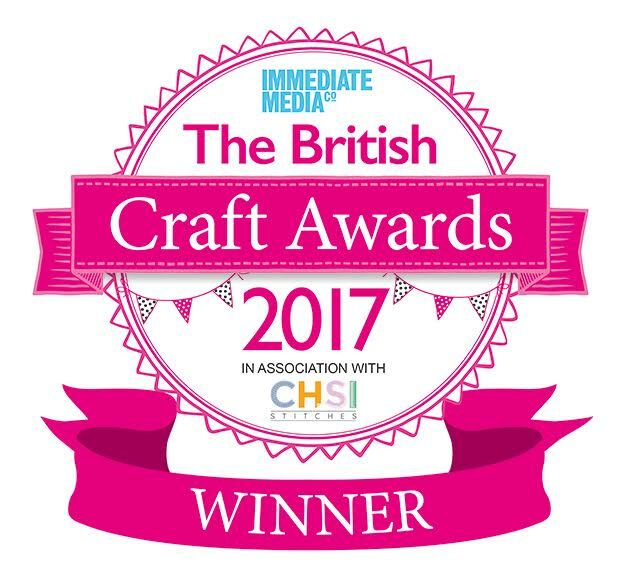 Hi Carol, Congratulations on the British Craft Award! You so deserve this award as you put so much heart, energy and beauty into your posts. I am thrilled for you. I am always excited to see your Easter bunnies. The pink/gray is beautiful and I can't wait to see the finish on the next one. I have very little out for Easter this year as we are in the middle of preparing to sell so I am living vicariously on other people's Easter decorations this year. Your 'Walk in the Woods' is beautiful and fun. I am so sorry about your friend. We just have to keep trying our best to make each day the best it can be. Somehow, when it is people our age, it hits us differently and really makes us re-evaluate and decide if we need to make any changes. Thanks as always for the pleasure of your blog Carol. Congrats on winning the award!!! Congratulations on the blog award! What an honor to receive and Carol, you are truly deserving of it. I love your bunny pieces. You have made steady and good progress on the Walk in the Woods piece. Go Carol! Sorry to hear about your acquaintance's death! You are right about making the most of each day. Thinking of you! Such adorable bunny pieces. I like stitching bunnies too even though Easter is irrelevant to me. Cool that you can do that and make progress on the sampler as well. Congrats on your award, you super-star of stitchers! You can display your trophy next to all of your sons' school sports awards. Sorry to hear about your friend. These stories become all the more frequent as we age, but it's the way of world.. circle of life and all that. Retire when the time is right for you. It's different for everyone. Our snow kind of fizzled and I'm perfectly happy with that. Only a couple of inches around here. But cold, windy, icy so I'll stay put inside. I'm sorry to hear about your friend. We never expect something like that can happen so quickly. If you're able to retire, I definitely recommend it. We've had to tighten our belts a little, but we have more than we need, we're able to travel a bit, and I'm filled with happiness each day rather than the dread of going to a dreary job. I can sew, donate quilts, and volunteer. And . . . I can stitch bunnies! Now you've got me in the mood for a new rabbit. Must go search through my patterns. We're snowed in today, so no guilt! I am also very sorry that your lost. Rest in Peace. Death is the only truth in life that never changes. For that reason, no matter how long we live; every moment must be filled with goodness and love. Thank you for lovely winter images too. My deep condolences on the loss of your friend. I can relate to your thinking about how you spend your time. I'm in a season of re-evaluating my priorities, too. Congrats on your award! Your blog is my favorite for sure. Nice bunny finishes. I had a pair of shoes when I was around 8 or 9 that were my most favorite. They were suede with light beige, dark beige and they had that weird pink sole that reminds me of pencil erasers! If my mom let me, I would've wore those shoes to bed! Nothing like a death of someone you know to make you think if you are making the most of the present time. My condolences to you, Carol. It's about time winter reached your area! Here, I'm watching the trees bud and I've turned off the heat for the house but I'm sure it'll come back on for a time or two before the weather heats up. Have a nice day! Congratulations on winning the British Craft Award, Carol! Love the pink and grey combination. When I was a young adult I had a pink and grey comforter and curtains. Congratulations on your award! I love visiting your blog and your finishes are INSPIRATIONAL! I am sorry about the loss of your friend, you just never know, do you? I've been thinking about retiring more and more, it's a little early for me, as I'm turning 60 in June. I would like to leave work at 62 but financially it looks to be more like 65. I keep thinking of all the things I want to do with my time, I know I will never grow bored, many hobbies and interests. I'm a bunny lover too, right now I'm concentrating on Spring and Easter. I've pulled out a couple bunny patterns from Lizzie Kate and Prairie Schooler. And I've put out the bunnies around my house but today, Spring has made a hasty retreat...we are getting snow, LOTS AND LOTS of snow!! Thank you STELLA! A big congratulations to you, Carol, on the British Crafts Award! Were we surprised? I think not! It is well deserved as you post with such wonderful stitching, photos and stories. I have seen on the news the *huge* blast headed your way. It's unfortunate that your son's visit coincided with that - yikes! I'm sorry to hear about your friend's passing. Life is short, isn't it, and you just never know. Enjoy each moment and be kind to each other, that's what I say! Carol, I am so sorry for the loss of your acquaintance. I know what you mean about re-evaluating things and looking more at retirement while we can enjoy it. Congratulations on the award!! Can't wait to see that trophy! I think the bunny would be cute as a flat ornament in a sideways oval shape! Just my thoughts! Congrats on your award. You deserve it. Your bunny pieces are so cute. The one on black really stands out. I love your In the Woods piece, the colors are very pretty and I look forward to seeing more of it. Congrats on the award Carol! 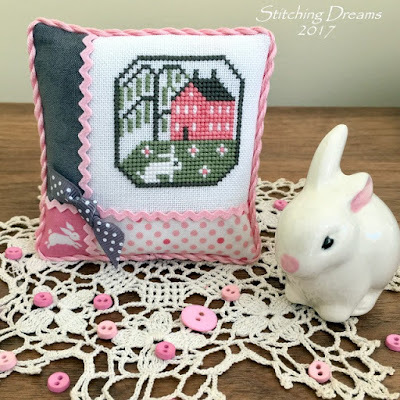 I always enjoy reading your blog posts and seeing your wonderful finishes - that bunny pillow is so cute! I'd like to be entered into the drawing for the "Gathering Eggs" chart. Congratulations on winning the craft award Carol. You deserve it. Also congrats on another gorgeous finish. I so wish I could finish some of my over 150 finished pieces like you do. Nice progress on the alphabet and cute rabbit stitch. Thank you for picking me as the winner of the chart. I am sending you my address. Congratulation to the Britsh Craf Award. Your two bunnies are very cute. I love them both. Congratulations Carol, you so deserve the award my friend. Love your bunnies , I have always loved Spring and bunnies. Your WIP is looking so beautiful. I would love to stitch your giveaway , love little girls. I am so sorry about your friend , life is so fragile . We have to make the most of our time it is a gift from God. Congratulations on your contest win. You certainly deserve it. I often marvel at the perf cation of your stitcher no creations. You have so much talent and are so kids me to share it with the world. You inspire me for sure. Retire as early as possible. I'm about 10 years older than you are and have multiple stories like the one you mentioned in your blog today. It breaks my heart. Since January we have 5 friends or relatives with cancer. 3 terminal. All ages 50 to 75. Carol, it is such a blessing in my life to open your beautiful blog ...see your lovely work and read your sweet words. I'm not at all surprised that your blog won the British Award and that it was from votes cast from your loyal readers. I wasn't around in the stitching world at that point, but I can tell you that now your blog is a great encouragement and has so much inspiration for me. I'm so sorry about the death of your acquaintance...it is hard when death is unexpected (and even when it is expected). Death gives us much food for thought about our eternal destination, doesn't it? I see in your description of yourself that I feel a kinship with your personality, although I'm 10 years older and have been retired from nursing for about five years. And I don't want to forget the bunnies! Adorable! Your finishing is so excellent...I have a long way to go in that department! A big snoopy dance for your award Carol. So happy for you. I started my blog 8 years ago, almost 9 now, I remember how we met. How blessed I am to have met a wonderful person. Times just flies doesn't it. Love the bunnies. I am a big bunny fan also. I am sorry to hear about your friend and your loss. Retirement is not such a bad idea. The snow pictures are so pretty. I hope you have a great stitching week. Congratulations, Carol! You deserve it for your beautiful blog! Always love your stitching and finishing, I am also a bunny fan! Love your winter pictures, no snow in Singapore ha ha! Early retirement is good, more time to stitch and enjoy life! Congratulations on a well deserved award! Your stitching and finishing are always so beautiful and inspiring. What a well deserved honor! Your bunny stitches are so sweet. So sorry about your friend's passing; we sometimes find our wake-up calls in unusual places. Beautiful, beautiful stitching and perfect finishing, as always. We have had a very mild winter, no snow at all,but very damp, the days are getting better now with some lovely Spring sunshine. I must admit that I've missed not having a proper Winter. So sorry to read about your friend, so sad, it does bring everything in to perspective when you hear something like this, we have to make the most of every day don't we. Congrats on the award, Carol! :) Your bunnies projects are cute! Do you have bunnies as pets? Your bunny pillow is adorable! How pretty your ceramic bunny! Love your another bunny stitched on black! So sorry about your friend. Life is too short. I love your pink and grey rabbit finish and your sampler is a delight to look at. You are a SUPERSTAR Carol.. everything you stitch and finish is perfect and gorgeous...Of course you need a trophy!A big one! I might have to stitch up that Prairie Schooler bunny you did on black .. it is amazing... along with your other projects! So sorry about your friend ..
Congratulations on your award! I have been browsing through your pieces and they are truly award-worthy. Those cute little bunny pieces are adorable. I am sorry to hear of the loss of your friend. These things always do make us re-evaluate our plans and future. Such sweet stitching Carol; I love bunnies too. If only this snow would go away I might be more inspired to stitch some! Congratulations on your blog award! Of course I'm not surprised at all, but it's exciting all the same. Congratulations on your win! It is certainly deserved! I love you new bunny pillow, such cute finishing. Congratulations on your win....what fantastic news! Love the bunny pillow, what a sweet finish. Congratulations on your award Carol! What an honor and so very exciting for you! I just love your bunny finishes and am over the moon with your Walk in the Woods progress. It's really making me want to drop everything to start it but I have my hands full with the wedding sampler and christmas ornies I have started. Oh, to have more stitching time, right?! I'm so very sorry to hear the sad news on your friend's passing. It certainly puts life more into perspective especially when people leave us at a young age (you're not old!!). Retirement sounds like a wonderful thing if you can manage and would allow you to look into interests you haven't had the time for. Hugs from sunny California. Hi Carol: Congratulations on winning the Award what an honor. I am saddened by the loss of your friend. I love your Bunny finish's oh so sweet. I remember a dress I had back in the late 60s it was gray and pink, love those colors together. Please do not include me in your giveaway I have the magazine. Walk IN The Woods is such a lovely design, great progress. We had snow last week-end, I am waiting for the first day I can sit out on the front porch and have coffee and watch the birds. Congrats on the win - that's so exciting! Walk in the Woods - I think that one may have to go onto my 123 Cart :) one to get once Stitch From Stash ends! You are so right Carol. A few years ago I stitched, This is the day the Lord has made, let us rejoice and be glad in it." I was telling myself that an ordinary day is a very wonderful thing. Hallmark also had a movie called, "The Magic of Ordinary Days." That saying works too. I don't always stick to it but I do try. Congratulations on the award. I can't think of a anyone who deserves it more! Congratulations on winning the Cross Stitch Blog of the Year award. Such a wonderful achievement! I'm so sorry for the loss of your friend. 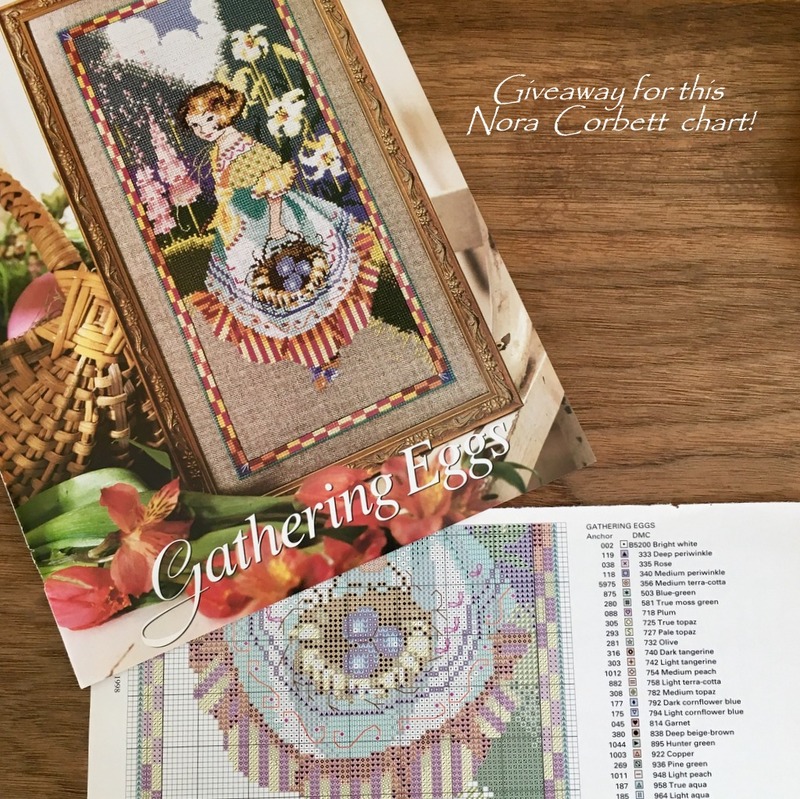 Please include me the draw to win the gorgeous Nora Corbett chart. Have a good day! Hi Carol! Where do you buy the fabric to cross stitch? Is it by a store in internet? Sweet bunny, she does look cute in the pink/gray combination. Congratulations on your Blog win. Congratulations on your award-winning, my dear friend! I am so happy that you are the winner - you really deserve it!! Sorry to read about the loss of your friend. What a sad story! No wonder that it makes you think about your future. Nobody knows what lies ahead and we all should spend as much time as we can with our beloved ones. I love your stitchings (as always) - this white bunny on the black fabric is amazing. Wow Congrats on your win! What a win it was!! I just swoon over your beautiful bunny finish. It just looks perfect!! Love your 2nd one and can't wait to see what amazing finish you come up with as always. Life is too short. It's hard to get reminders of that. Congratulations again on winning the award, you had some stiff competition LOL. I am so pleased a "not for profit" blogger won too, you have a very inspiring blog with some lovely finishing ideas. So sorry for the loss of your friend, even if we are not close friends with someone it is always a shock to hear of their passing. I would love to be in the draw for the Nora Corbett chart, I love her work, if you don't mind mailing overseas that is. Have always loved your crosstitch designs you choose and love the finishing of all your projects. It's a real treat to come and look for some inspiration from your blog. I'm so pleased of your award, congratulations. How come that we are not surprised:) Lovely photos of the snow scenes( don't have snow where I live down under) so can't really imagine how cold it is. Currently here we are having beautiful warm settled weather but Autumn is definitely making herself felt this week.I love it. I am so sorry you lost a friend, it sort of puts you in a place of pondering and dwelling for sometime and asking yourself questions doesn't it. I would like to be entered in your draw for the Mirablia crosstitch design. My email is brandy.1@xtra.co.nz Have a great week Carol and enjoy your stitching. I adore your cute little bunnies--they are the sweetest, and so beautifully finished, too! Congrats on your Blog of the Year award. You so deserve it! Congratulations Carol! Very well deserved! So sorry to hear about the loss of your friend. It really does put things into perspective and make one wonder about their purpose. Loads to think about. Carol, preciosos tus bordados, el que más me gusta es el abecedario queda divino. Beautiful stitching and finishing. So sweet. Your WIP is coming along nicely too. Sorry to hear of your friend, it's always a hard time. A former work colleague died at the end of February, 53 years old, had been diagnosed 3 years ago with motor neurone. Obviously it was expected but always a shock when it does. If it's feasible I would retire as soon as possible. I'd love to retire tomorrow and I've just turned 49!! Congrats on your blogging award Carol. I certainly think you produce award-winning content. I had never considered a pink and gray color scheme before - it works wonderfully well for your bunny stitch. Inspirational stitching and finishing. Both of those bunnies are adorable and make me want to dig through my stash to see if I have a few I could stitch! They do make the cutest stitches! Congratulations on your big win - I really enjoy every post you share and it is no surprise to me that you were recognized officially! Sorry to hear of the passing of your friend of a friend. My aunt died a few years ago far too early from ALS - it took her in just a few years, and has had a similar effect on me as you described- we aren't waiting for the perfect time to do the things we want, but are forging ahead now! I am sure it gives you lots to think about - just imagine all the stitching you'll be able to do in retirement! I'd love to be in your drawing for the pattern - that's one I'd enjoy making! Hope you have a great visit with your son! Congratulations on your well-deserved win Carol! You have such a lovely blog, it's no surprise you've been officially recognised. I love both of your bunnies. Pink/grey is a classic combination but for some reason always makes me think of the 1980s. I must have had a garment or two in that colour scheme! Sorry to hear about your acquaintance passing away too young. Your Bunnies are too cute, what a great finish. Pink and gray are a great combination. Walking the Woods is looking great too. Tomorrow is the 1st day of Spring. Congratulations on the award! You definitely deserve it! Now why am I not surprised you were voted Homecoming Queen in high school? Makes total sense to me! Love your stitching as always. Bunnies at this time of year are perfect. Your story of your casual friend's death has given me pause too. It's so true -- you never know what is down the road. I've been thinking too often of being an older person now. It's sobering. Anyway, enjoy your visit with your oldest son! Congratulations on your award! How exciting for you, and I think it's great that you'll receive a trophy! How fun is that??? I certainly understand, from experience, your thoughts about losing the friend and the plans they might have had. Life can really throw a wrench into the best laid plans. Somehow, we recover but it isn't easy, and things are never the same. The bunny from Book 52 is too cute and you did so well with the colors change. No matter what age we are in Carol, we are always learning and progressing. Congratulation Carol for the award ! Sorry for the demise of your friend. I believed work while you still can and enjoy doing what you love and always appreciate the people around us. Just make the most of each day to be happy. It's no wonder that you won, warm congratulations! Your latest finish is wonderful again and the sampler grows up beautifully too. Hope you have a sunny week! I love seeing all your stitching! Do you sew or glue the ric rak and little bow on? Winter hit us last week, but we didn't get as much snow as was predicted. Congratulations on your blog award. I'm so sorry to hear about your friend's passing. Congratulatiuons on winning the award - and you definitely deserve it with your interesting and inspiring blog. This entry is another good example. Look at those pretty and cute bunnies. I also love stitching bunnies - the more the better, lol. There is also some nice progress on your big sampler and I can see why you enjoy every single stitch on it. The little bird that you added is too sweet and must have been pure fun to stitch. So sorry for the loss of your friend. I agree with you, at a certain age it's a must to think about how we want to spend our time. Life is short and we only have one. Many congratulations Carol on a well deserved win, how exciting and you can look forward to receiving your trophy and certificate of recognition. I´m eager to see just what this trophy is like and hope you show us a photo. Sorry about the sad news of your friend. Lovely bunny stitching. Congratulations on a much-deserved award, Carol!!! I'm afraid I would have been trying to stow away in my son's luggage - sunny, warm California sounds wonderful. : ) And you've done some sweet bunny stitching! A Walk In the Woods is looking gorgeous! So sorry to hear about your friend. I'm feeling more and more aware with every passing day just how short life can be and how unpredictable. I think if you can retirement sounds like a lovely idea! Congratulations of a great award Carol. It does not surprise me you received such great recognition. You have a wonderful blog and your stitches and finishes always inspire me. Well, what can I say? We Brits recognise talent when we see it! 😀 Seriously, huge congratulations on your award. Such a great - and well deserved - achievement. Your bunny finishes are so cute. I really must purchase some black linen. I love to see your finishes on black, they are always my favourite. Oh Carol, I know what you mean about living in the moment. This week has been incredibly sad. The 14 year old sister of one of Iris's friends, died. She had had a long battle with cancer. Explaining to our three, why somebody so young had died, was so hard. And only yesterday I got a message from my best friend who lives in Brisbane, Australia. Her mum has terminal cancer and doesn't have much longer left to live. Life can be so unfair. I LOVE your bunnies! And Walk in the Woods is such a lovely pattern! Congrats on the blog honor! Your blog is one of my favorites, so I'm not surprised you would win something like that! I'm so sorry about your friend who passed. Big congratulations on winning the blog award. How exciting for you! I love your finishes. They are always so adorable. I've known several lately who've passed away. It's so sad and makes one think about their own mortality. :( So, have you decided to retire? Congratulations on a well deserved award Carol. Your finishes, as always, are beautiful. It always makes me smile when I see them. The little bunny with the pink house looks so cute! Love the snow photos. I so wish we'd had some like instead of the couple of flurries we had that were gone no sooner had they come. I am happy to have a little warmth now though now it is Spring. I just don't like it when it gets too hot! I am so sorry to hear about your friend. It certainly makes you think doesn't it? Congratulations on winning the Award!! Congratulations on your award! Cute finishes and great progress on your sampler. 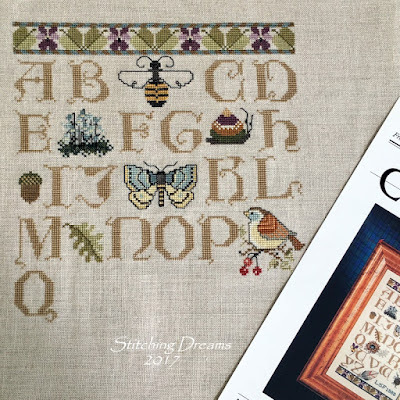 I am just catching up on blog reading, Congratulations on winning the craft awards, I was thrilled my friend won, you so deserve it as your blog is beautiful and your stitching is awesome! So sorry to hear of your friends passing, you just never know, life is short indeed. Carol! Congrats! I really think your blog is the best!! :) I'm so, so happy for you! My simpathies for your lost. Life is every second that we received... then, every second count. Health problems are part of my life and I know it well. We have to enjoy every day with its ups and downs. Dear Carol, Oh, I must apologise, I was so very sure that I had already commented upon this post and upon your great win but I cannot see my comment in the list - so maybe I imagined it????? First things first, Congratulations for your British Craft Award - so very well deserved, my dear. You should feel proud! Next, I am so sorry to hear of the death of your acquaintance - oh boy, that is so quick and she is so young, really! I can understand why you have been reevaluating life, as I approach 60 (next year) I have been thinking about the future a lot. Lastly, lovely stitching and finishing on the bunny and a lovely chart that you are giving away (I know who won as I have seen the next post already - congrats to Jo.) hugs, Kaye xxxx P.S. Lovely photos of the snow.